I haven't been writing for this blog for a few weeks - we have been on holiday and I am, photographically, in a rather unproductive phase. Not really a kind of photographers block, but a lack of motivation and/or dedication. This carcolor composition is, hopefully, the restart for more regular posting. 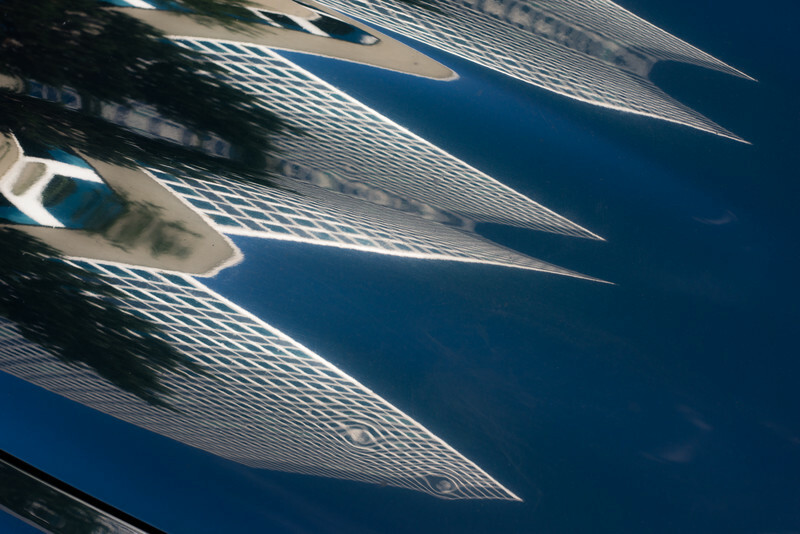 It features a high-rise office building in Zurich, but it is really the particularly bent and shaped engine hood of the car that was photographed here, which is solely responsible for all the interesting effects (unjustly, the surface itself is almost invisible). The undulated surface triplicated the reflections - there is only one building - and two dents created strange distortion effects in the foremost reflection. If you are interested, many more carcolor reflections and distortions are found here.